So Obama Was Lying All Along About Gay Marriage. Is That Bad? 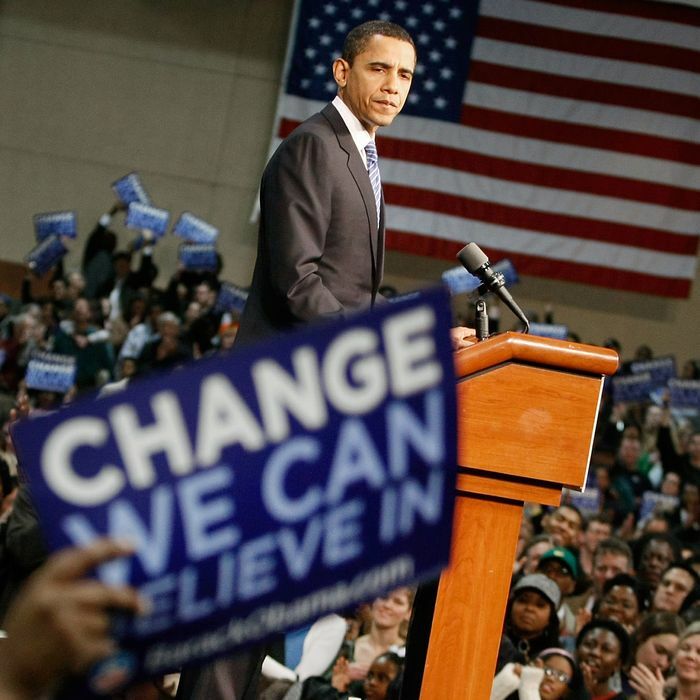 Eight years ago today, Barack Obama formally declared his presidential candidacy. He was opposed to gay marriage, a stance that his former adviser David Axelrod now admits was a sham. Obama privately believed in gay marriage, but calculated that declaring himself publicly for what was still an unpopular position would harm his candidacy. It’s worth thinking, a bit, about whether and to what extent Axelrod is confessing to a genuine sin. There are a number of surrounding considerations that mitigate, but don’t fully excuse, what we can now plainly call a “lie.” One is that Obama had no direct decision-making authority on the issue — which is to say, lying about his stance on a mostly abstract policy issue is not the same as lying about whether he’d sign a health-care bill. Another is that Obama had the decency to lie badly. That is, he did not make opposition to gay marriage a central tenet of his political identity, vowing to use every power at his disposal to block this threat to the sanctity of marriage. Within a few years, everybody knew that Obama actually favored gay marriage. Does the Economic Boom Prove Mitt Romney Was Right? It is also likely the case that Obama knew that public opinion was moving toward the acceptance of gay marriage, so his failure to lead public opinion would not ultimately prevent the success of a cause he privately recognized as just. The trouble with this rationale is that it looks at the issue only from the perspective of gay marriage, which is the frame most liberals have used to evaluate Obama’s rhetorical maneuvers. A different way to think about the question is: Do voters have some right to judge candidates on their own preferred terms? In other words, putting aside the merits of gay marriage, which I endorse, one can also believe that a democracy works best when voters have accurate information about the candidates’ beliefs. I may not agree with the beliefs of anti-gay-marriage voters, but my disagreement with their beliefs should not deny them the ability to vote against a pro-gay-marriage candidate if they so choose. To be sure, the voters’ right to know what the candidates believe is not absolute, and it’s routinely violated by a political-media complex that does a horrendous job of informing them. But this process of industrialized spin is a bad thing. When a candidate contributes to public misinformation, regardless of his good intentions, he has done something morally questionable. Obama Was Lying About Gay Marriage. Is That Bad?